It's one of those counterintuitive facts of life, like 'Which line is the longest' in optical illusions, that every bikers bar needs a Pink Professor among their clientele. I say they "need" a Pink Professor, but of course that doesn't mean they actually have one. They can stumble along apparently in a very nice way and have a reasonably nice business. They'll have bikers in and bikers out, with a kind of malaise that is barely discernible but nonetheless is very much there. They'll appear to be enjoying themselves and yet there'll always be the nagging sense that something's missing. It's my contention that actual Pink Professors are tough to come by. Not tough to come by in that there's very few of them. But tough to come by in that they're not always drawn to bikers bars. They're very smart individuals -- that is true -- but it usually escapes them that a bikers bar needs them and would welcome them if they were to show up. I feel fairly proud, I have to say, that I know about this. I didn't always know about it, of course. But I had the opportunity of meeting the fellow in our town who's called the Pink Professor. And I know of his place at one of the local bikers bars. And I'm guessing about the rest -- call it human nature -- that other bikers bars, whether they know it or not, need their own Pink Professor. The whole thing about it being counterintuitive ... it wouldn't have been my first thought. That they gave him a hard time, I could put a check mark by that; that I'd get. We don't immediately accept it that rough will accept nice, since it seems like rough will only accept rough. But it's kind of like in Ike and Tina Turner's version of "Proud Mary," where they do the first half nice and they do the last half rough. The Pink Professor indeed is a nice guy, and, remarkably, he fits right in! One theory about this is that rough has no way to distinguish itself if there's not a nicer or softer counterpart. It needs the contrast by which to more clearly define itself. Then I'd add to that, to nudge it along a bit, that there's a soft spot in the heart of every biker. They're a band of brothers, after all, and you don't get that simply with rock solid roughness. The softness necessary is self evident. So, whether it's with a brother, one of your own kind, or with one who draws a greater contrast, they're very open to all people. It's just that a Pink Professor is so obviously a different personality type that we think at first that they can't mix. In fact, they like him a lot! And he likes them a lot, too! It's a beautiful thing, giving us all hope that, given enough time and effort, all hostilities might cease between peoples, of different countries and persuasions. The Hatfields and McCoys, the Israelis and Palestinians, Republicans and Democrats, Freepers and Sane People. If they can do it somehow on their own, more power to them! 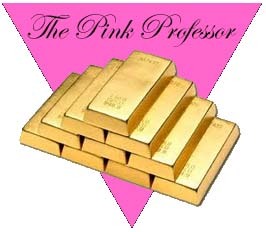 If it takes a Pink Professor type of individual in their midst, then so be it. The actual Pink Professor, the one I know, is well aware of the way he fits in at the bikers bar, and he relishes his role. But for him, it's all sincerity. When he shows up on an evening, he's not thinking of his role in an analytical way. He's always thinking of it in terms of the real relationships he has, and the fact that he, as a patron of the bar, also wants to have a good time. So he's not looking for any favors or any breaks. As far as he presents himself, he's simply one of the guys at the bar. Nothing different about him. Just one of the boys. That's true, and we would never take that away from him for a minute. We love him too much. But we can stand back and see there's a whole other dimension to his place in that setting. He is the Pink Professor, indispensable to that bikers bar's vibe and rich camaraderie. Worth his weight in gold!